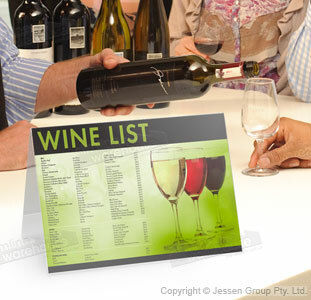 A4 Menu Holders Use a Slide-In Design for Easy Changes! 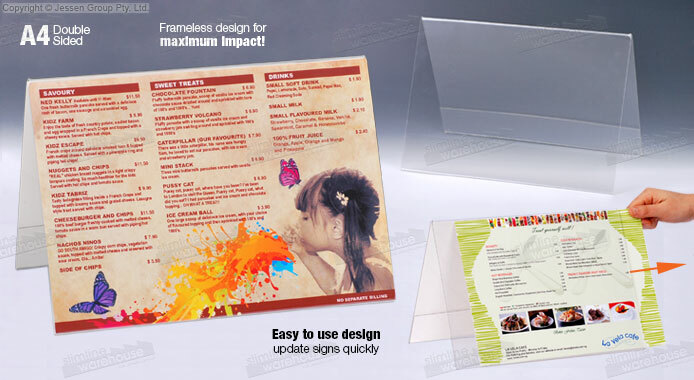 These A4 menu holders are made from 1.5mm thick clear acrylic, providing a durable display made from bent plastic that is offered at a low price that works with any budget! The display stands keep your displayed graphics free of grime or dust during display as well, helping to keep a professional look to work well within any décor! 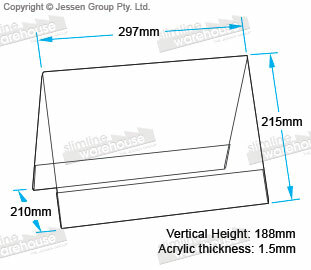 The perspex sign stands, A4 menu holders are designed to hold A4 (297 x 210mm) graphics that are in landscape orientation, plenty of space for communicating effectively with customers and potential clients! This holder uses a frameless design that allows the whole graphic to fill the holder to easily be read due to the clear acrylic! Switching out graphics on this stand is easy as well, with no tools needed to quickly change poster by simply sliding them out through the side. The design of this acrylic holder also keeps the signage in place on an angle, increasing readability to ensure the stand reaches out to potential clients effectively! The dual-sided display is able to reach more customers at once whilst taking up little table or counter-top space in order to maximise exposure. This stand is a great purchase for many different locations, able to look great in retail stores, art galleries, bakeries, car dealerships, transit stations, travel agents, restaurants, bars, information centres, and many more! The large selection of plexiglass signage frames includes various styles & sizes in order to best fit in with your business needs. There are many types of counter-top graphic holders that are found at businesses nationwide, helping you to effectively promote to customers. Click here for access to our extensive online catalogue with a large selection of products conveniently broken down into categories in order to make browsing easier. Our products are all thoroughly tested prior to being offered for sale, ensuring only long-lasting goods make their way into the hands of customers! With over 20 years in the business, Slimline Warehouse has become a national leader famed for our low prices & quality goods. Our relationships with vendors both local & abroad help to fill our site with products that truly work without compromising on quality. Orders made by 1pm EST will despatch same day to anywhere in Australia with most in stock products, including to Brisbane, Melbourne, Perth, Adelaide, Hobart, Darwin, Canberra, Toowoomba, & Sydney!